Our La Croix Cross Back Dining Chair is a real showstopper! The heirloom quality is second to none and sure to suit any space. Available in your choice of oak, cherry, maple, or brown maple. Constructed in 100% solid hardwood by Amish experts who are dedicated to providing the very best for you and your family. As you can see from our photos, many looks can be achieved with the La Croix. We offer a rainbow of paint colors as well as stain options for you to choose from. We love the two-toned look of a painted chair and wooden seat. The La Croix also looks excellent in a creamy white shade with the seat upholstered in a deep colored fabric that really pops. As you can see, this dining room chair looks good in many hats! 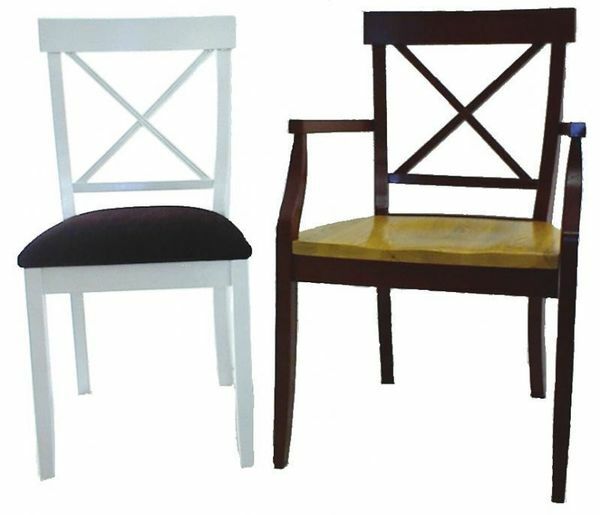 Order in an arm or side chair to suit your space. You will be delighted by the support that this piece provides. Family and friends alike will be able to enjoy hours of each other's company in total comfort. Thanks to the expertise of the Amish, you will enjoy the La Croix for years to come.